The Villa Oplontis, also known as the Villa Poppaea, was an elite Roman Villa. A Roman holiday home, archaeology has uncovered baths, gardens, a guest suite and swimming pool. The Villa Oplontis was preserved by the eruption of Vesuvius in 79AD. Excavations have revealed it to be an elite Roman holiday home rather than a permanent residence. Notable features include baths, cubiculii, triclinii and frescos, as well as indoor and outdoor gardens, a guest suite and an outdoor swimming pool. Located in modern Torre Annunziata, the Villa Oplontis is one of two elite villas belonging to Roman Oplontis, a small town named on the Tabula Peutingeriana, an ancient map of Roman imperial roads. After its discovery in 1964, archaeologists spent twenty years excavating and studying the complex. What was revealed was an elite home used as a summer retreat rather than a permanenet residence. 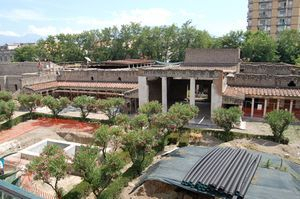 The style and scale of the villa suggested it was an important residence and it has been linked to Poppaea Sabina, second wife of the Emperor Nero whose home town was nearby Pompeii. The house was built in two phases. The oldest part of the house is a classical atrium style, dating to the mid first century AD. This remained the core residential area throughout the villa’s history. Later, the house was extended. This new wing was primarily recreational, centring on the swimming pool and large northern gardens. Overlooking the pool were a series of guest suites, each with their own sitting rooms. These improvements were still in progress at the time of Vesuvius’s eruption. The Atrium and Reception Rooms. The main reception room or atrium lay in the original residence. It had the traditional roof opening, the conpluvium, which allowed rainwater to collect in a central pool, the impluvium. The atrium was a vast room, decorated to impress both residential guests and clients. Its perspective was increased by visual devises. The walls were painted with 2nd style murals, which incorporated landscapes and mythological scenes into a framework of columns and porticos. This had the effect of making the room feel bigger than it was. Immediately opposite the entrance to the atrium were folding doors which opened to reveal a small peristyle garden, which again added to the sense of space within the villa. Roman Bedrooms and the Guest Suite. The most private area of the villa was arguably a person’s bedroom or cubiculum. There were two areas of cubiculi in the villa: those in the main house and those in the guest suite. The Main House. Here, bedrooms followed the traditional pattern of the roman house and were grouped around the atrium. There were alcoves for beds but there would have been little more furniture in these small rooms. They were, however lavishly decorated with 2nd style frescos. The folding window shutters of these rooms were preserved by the eruption of Vesuvius and their petrified remains can still be seen today as they were at the time of the eruption: half open to allow in air. The Guest Bedrooms. These were more plainly decorated in blocks of colour: white at the top and yellow, red or black at the bottom. Each room had its own sitting room, with niches for statues. Connecting each bedroom and sitting room was a small viridarium. The Roman Gardens-Peristyle Gardens and Viridarii. A viridarium was a small enclosed internal garden. In the Villa Oplontis, the walls of the viridarii were painted with intricate horticultural scenes whilst interior windows allowed vistas onto the sitting rooms and bedrooms of each individual guest. Other gardens were found throughout the villa. To the east of the atrium was the original large peristyle garden. Confined by the house, with colonnaded porticos on three sides, it was probably the private retreat of the owners, unlike the enormous northern gardens. These were landscaped and formed the setting for the villa’s swimming pool. Sculpture would have flanked the 61 x17m pool, which was tilted at the south end to allow water to drain away when the pool was emptied. A portico ran along the western side, facing onto the guest suites, allowing visitors wonderful views as well as easy access to the facilities. The Summer and Winter Triclinii. The location of the pool suggests that the guest suite was not just a place to house guests;it was a place to entertain them. This picture is completed by the discovery of a triclinium in the guest suite extension. This room was intended to impress-and would have done if it had been completed for the use of guests. It opened up to the northern gardens and was of an impressive size. The guest triclinium, however would not have eclipsed the triclinii of the main house. Situated to the far west of the atrium, there was a small internal winter dining room which opened into the summer triclinium. This room had a large door that opened out onto views towards the sea. A second style mural portrayed architectural features which served as frames for motifs such as peacocks, theatrical masks and emblems of the sanctuary of Apollo at Delphi. The mural which is remarkable undamaged, is still impressively vibrant. Roman Baths and Ancillary Rooms. The far north west of the house was dedicated to ancillary features such as the kitchen. The servant’s quarters were not in a separate wing but a series of rooms near the household lararium. They included a small internal peristyle garden and fountain whose plain decor showed it was part of the service areas. The bath suite was also in the north west quarter. It had two rooms:the calidarium (hot room) and tepidarium (warm room). In the hot room, tegulae mammatae- hollow terracotta slabs incorporated into the walls joined with suspensurae- brick pillars supporting the floor, to create a conduit for warm air that would have flowed around the whole room. The warm room only had the under floor heating, to ensure a cooler temperature. Both rooms were decorated in yellow, red and black in second style. The latrines were in the north east of the old house, well away from the public rooms but connected to the new wing of the house, making them accessible to guests and residents alike.